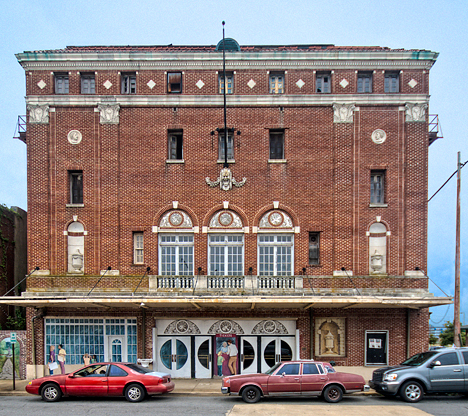 The 87-year-old Saenger Theater in Pine Bluff, Arkansas needs attention and needs it fast. Fortunately, a group of local supporters have organized and are raising money to stabilize and save the structure for eventual renovation to its former glory. The long suffering Saenger Theater in Pine Bluff, Arkansas is enjoying renewed attention just in the nick of time. 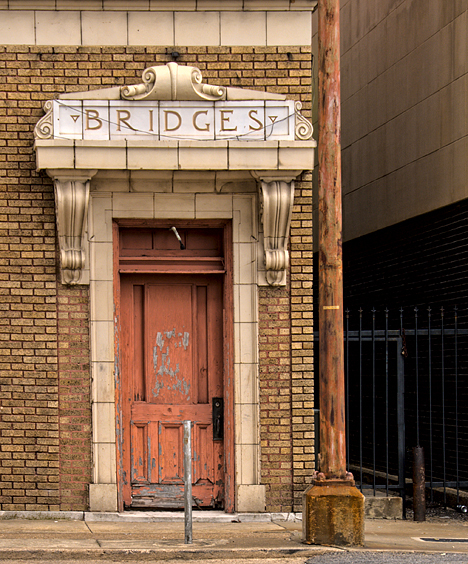 Little Rock video producer Chris Cranford got wind of the aging structure’s plight and put a video together detailing the predicament of the ailing edifice. It worked. The video touched more than a few nerves and stirred up substantial interest in rescuing the building from sure and certain disaster in the absence of attention. Now, more than 1,650 people are signed on to the “Save our Saenger” Facebook page and the Pine Bluff area is dotted with billboards soliciting support. The city now owns the Saenger and is taking steps to stabilize it to slow down the forces of nature and age. Click on the picture for old building pix. Before we go too much further, may we suggest that you take a look at the Photo of the Week page at Corndancer dot-com where this story started. You’ll see some of the theaters neighboring structures including the venerable old “Post Office Lunchery.” You’ll also get a few opinions on old buildings versus the newer ones. We’ll wait here until you return. The theater was more than a venue for movies. Vaudeville acts performed there along with other entertainment. It had a classic theater organ which would rumble the foundation. Thousands of attendees got their first taste of film entertainment in the grand old structure. It was the destination for countless “first dates,” and no-doubt was the site of at least hundreds of first stolen kisses. See more pictures of the Saenger, the Community Theater, and other historic Pine Bluff buildings in our Weekly Grist Gallery. This bad boy under the Saenger flag pole has been on the job since November of 1924. Wonder what’s on his mind? Though the theater has been dark for decades, say the word “Saenger” around Pine Bluff and you’ll probably trigger a recitation of recalled memories. I can remember my jaw dropping and roar of the crowd when Hawkeye and Trapper John dropped the shower curtain on Hot-Lips Houlihan and crew. 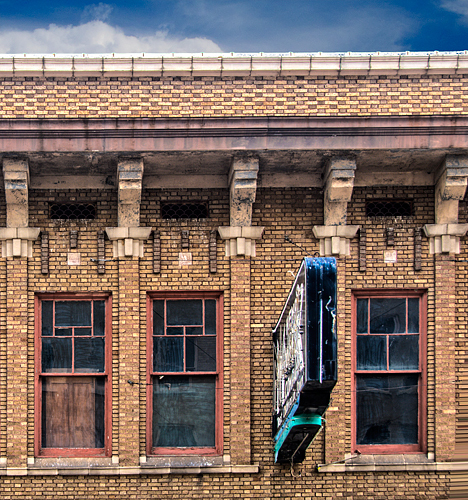 The arches above the windows on the front of the theater are in good condition and still show the attention to detail that is the hallmark of Saenger Theaters. 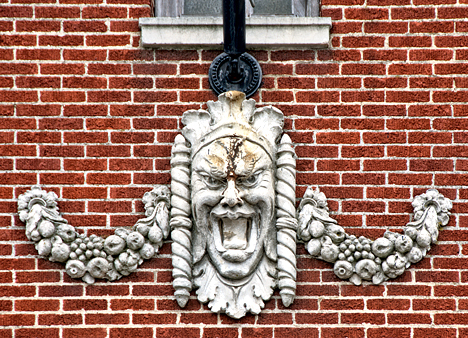 The details you see on the outside of the Saenger give you an idea of the former opulence inside. It was spacious with cathedral class ceilings and well appointed with all of the nooks and crannies reminiscent of an era when tiny little details and ornate decor were the order of the day. If the Saenger supporters have their way, we may yet see this opulence again. 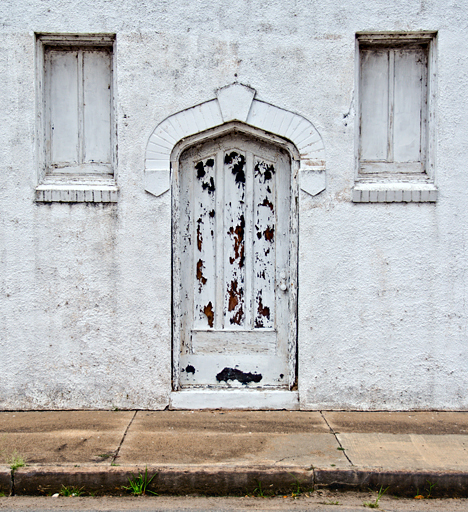 You gotta love the “Pointy” doors at the former home of the Harlow Sanders Cotton Company in Pine Bluff, Arkansas. Just a couple of blocks away is the building which last housed the Harlow Sanders Cotton Company. I’m not sure what it was before it was the cotton company, but no doubt will hear from someone and can add that information when it comes in. The building has three “pointy” doors (for lack of a better word), this one is on the side, the other two are on the front. This has to be the fanciest back door in town. 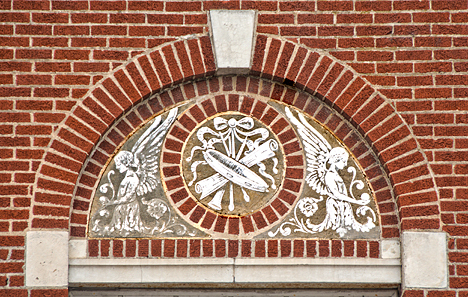 The building was last used commercially by the Henry Marx Company of Pine Bluff, the building owner. It now is home to a downtown church. You don’t find many windows like the ones you see in the upper floor of the Henry Marx Company building at West 5th Avenue and Main Street in Pine Bluff, Arkansas.The designer apparently wanted to achieve a unique look which probably gave a window maker fits as compared to a garden variety window with only two panes. Fits or not, the designer and the window maker were successful. Now there’s that little bit of art in our downtown. Just look up to see it. The windows have a unique design. Wonder why the one on the right side of the sign is different? What were they thinking? Did the window maker pull a fast one? the Saenger, the Community Theater, and several other historic structures in downtown Pine Bluff, including the old Post Office Lunchery, in our Weekly Grist Gallery. You’ll see some close up details most folks overlook. There are 31 new pictures of old stuff, some with lingering opportunities. Click and see.